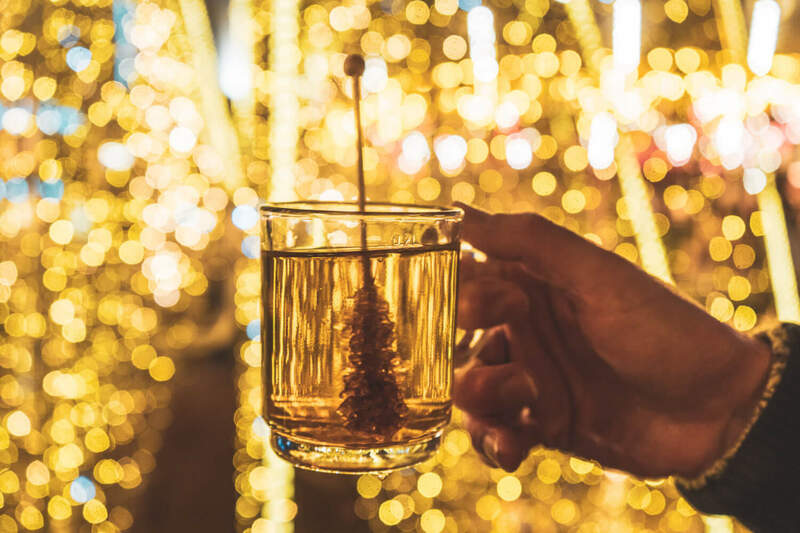 I’ve just returned from a whirlwind tour of Christmas markets around the Ruhr region, during which I visited Germany’s longest Christmas market in Duisburg, saw the world’s largest Christmas tree in Dortmund and ate my way through seven different markets in Düsseldorf. 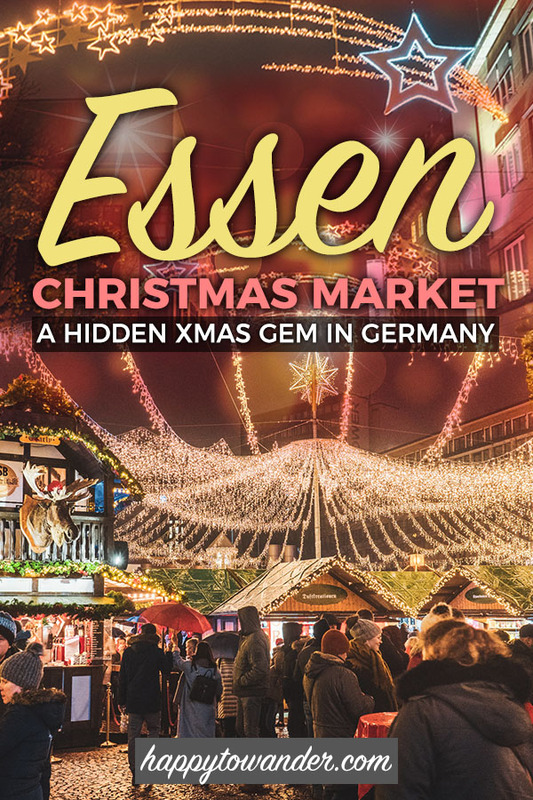 And yet, among this sea of superlatives and big promises, my favourite of them all was one you might have never heard of: Essen Christmas Market. See, Essen is a city halfway between Düsseldorf and Dortmund. 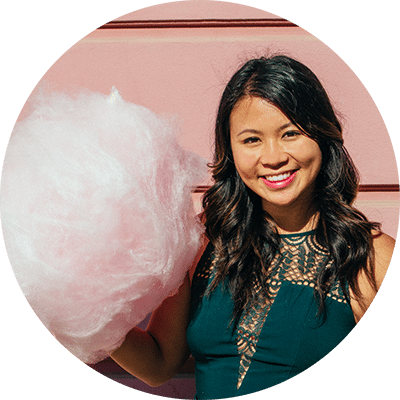 Longtime readers might remember my really random reason for visiting the city a few years back, and truthfully, I was going to skip it this time around due to time constraints. We were trying to hit 3 cities in a day after all, an ambitious task on any day, but especially so in the wintertime when the sun sets at like, 4pm. 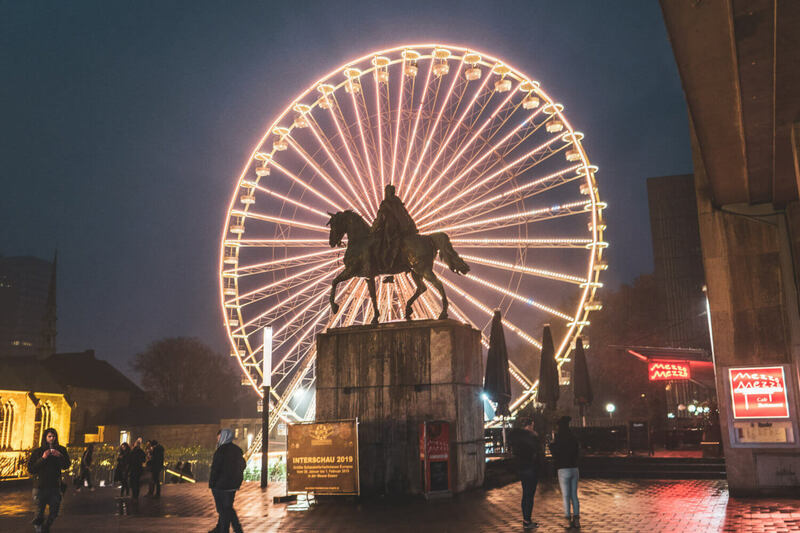 BUT, as our train came to a stop in Essen, and because we were standing anyway, we decided to hop off and check out the Christmas markets in Essen. The photos looked impressive, and in the spirit of “why the heck not”, we ended up discovering our favourite Christmas market of the whole trip. So, because I have too many photos to share, allow me a few minutes to gush about this lovely Christmas market that happily whizzes under most tourist radars. 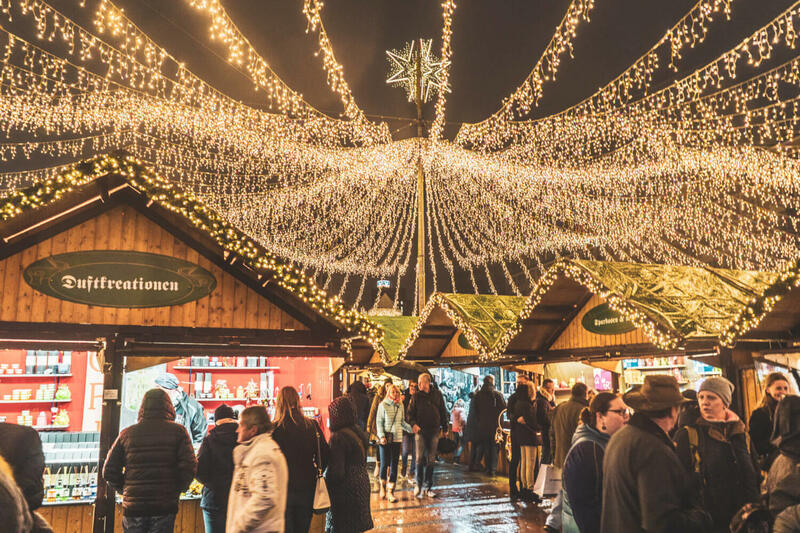 Here’s why you should consider a stop at Essen Christmas Market, less than 30 minutes away from Düsseldorf or Dortmund by train. 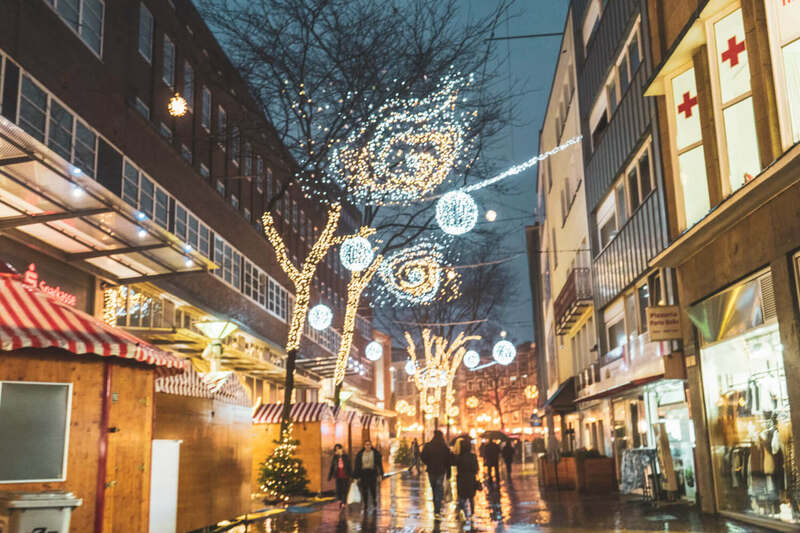 TIP: If you are still doing research for Christmas market trip, here are some recommendations. I always use GoEuro to compare/book transport options in Europe. It’s a free site that compares planes, trains and buses all at once and sorts them by price, convenience, etc. Also HotelsCombined offers a similar price check for hotels if you’re still needing a place to stay. Okay, you know that one friend that goes ALL OUT for Christmas, blasting Xmas carols in mid-November and covering their entire being in lights? In the Ruhr region, Essen is kind of that friend. Trust me, this city goes hard when it comes to Christmas. 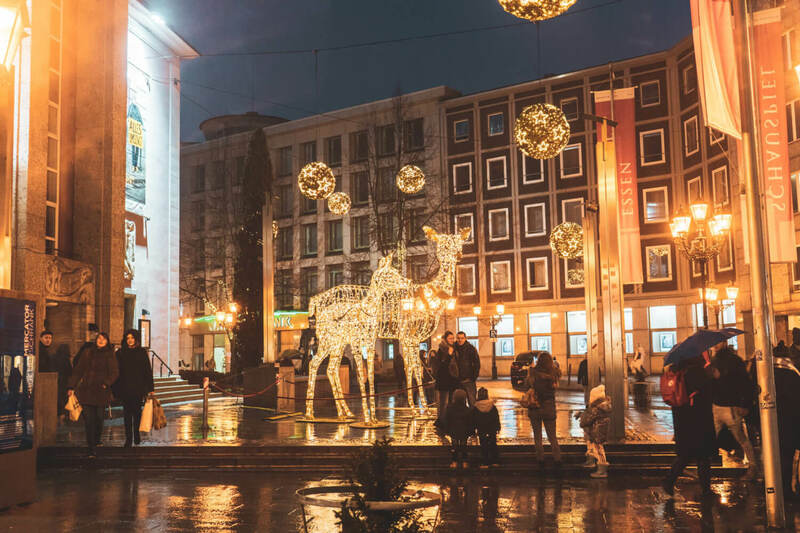 For the entire walk from the train station to Kennedyplatz, you’re surrounded by gorgeous lighting displays, from glitzy chandeliers to galactic swirls and lit-up “planets”. 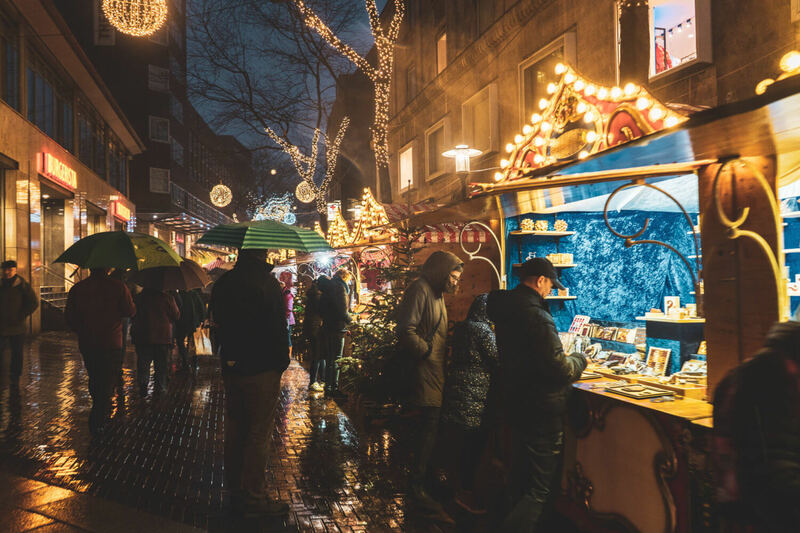 There are a few Christmas markets around Germany that include a medieval-themed market in addition to the standard markets, and Essen is one of them! 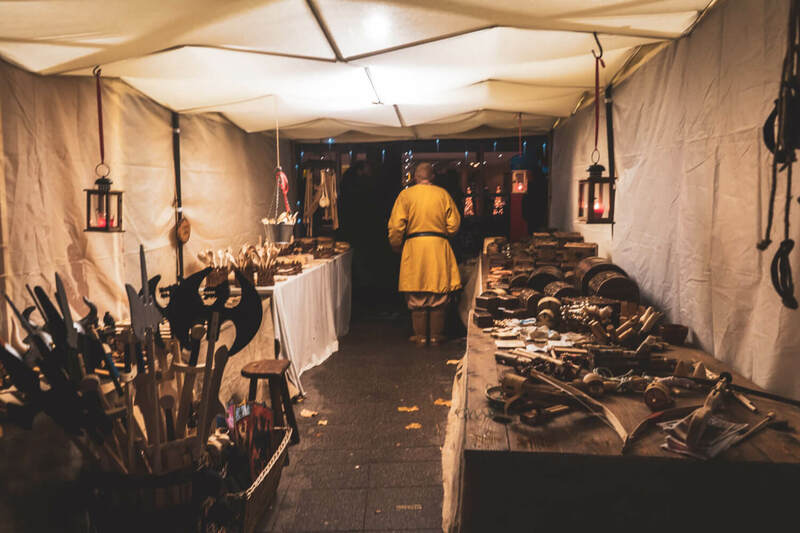 The Medieval market in Munich is one of my favourite Munich Christmas markets, and while the one in Essen is much smaller in comparison, it’s still a unique opportunity to shop for special gifts like leather coin pouches, wooden treasure chests and um… these things? 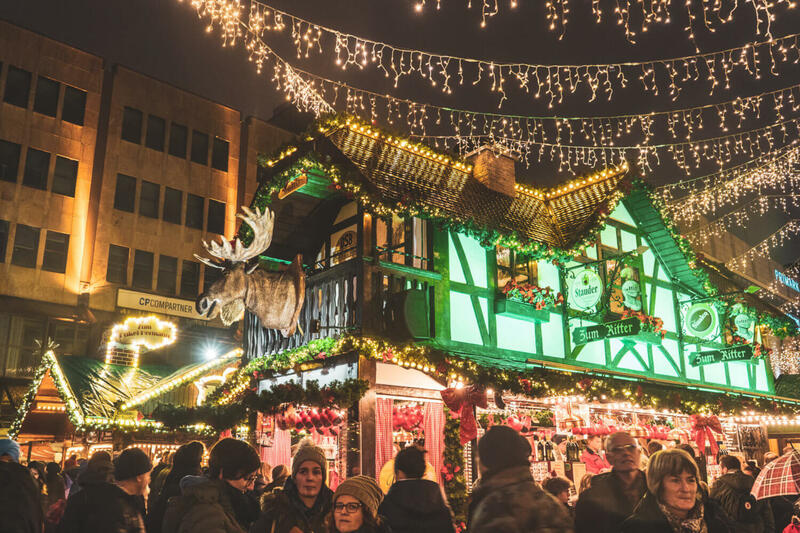 Branded as an “International Christmas Market”, the Essen Christmas Market is home to over 250 stalls that represent goods and products from over 20 countries. This means that in addition to the usual suspects of wooden ornaments, paper stars, etc., there are also things like amber jewelry from the Baltics or African handicrafts. 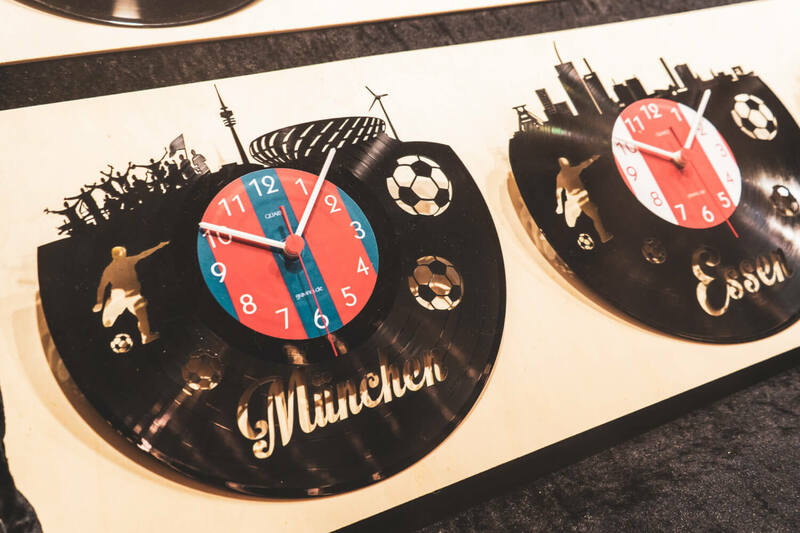 This gives it a definite edge over some of the more traditional markets in the Ruhr region. No joke, the Christmas magic starts in Essen right as you leave the train station. 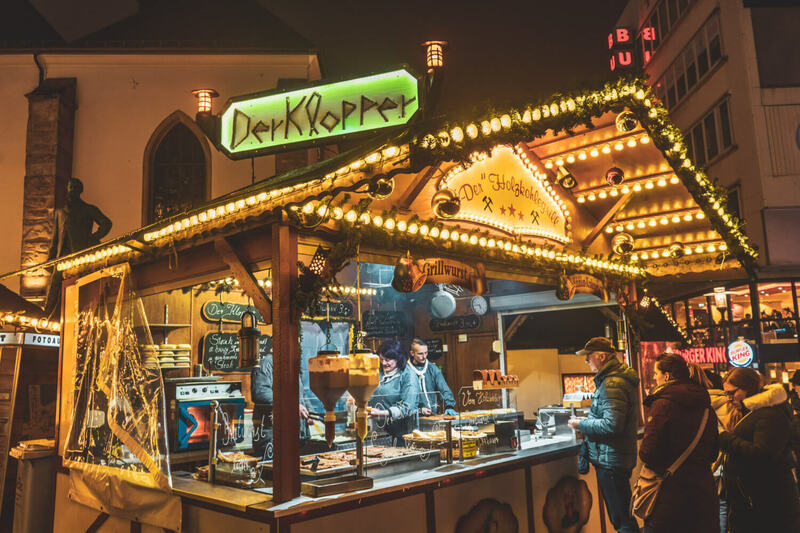 Not only is the main market in Kennedyplatz less than 10 minutes away from the train station on foot, there are stalls immediately as you exit the station and pretty lighting displays guiding you the entire way. I would literally visit Essen Christmas Market again for the SOLE purpose of getting this sandwich again. 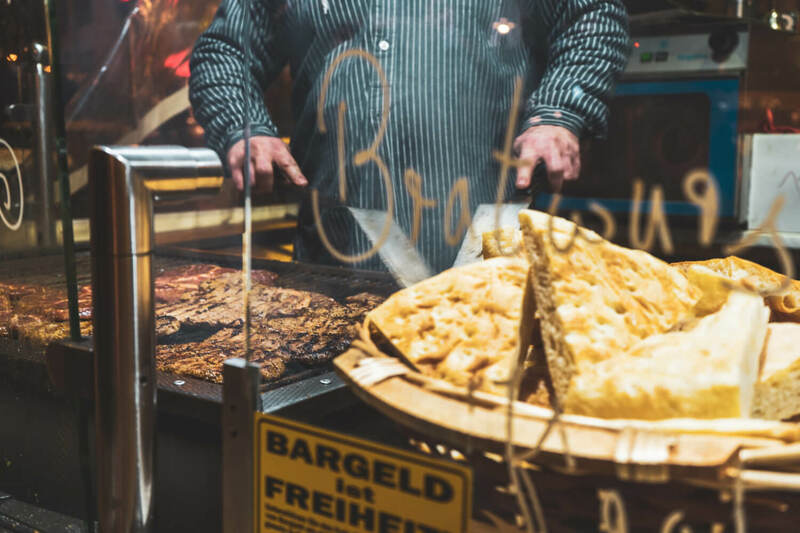 If you are in town, be sure to stop by the “Der Klopper” stall and get yourself a steak sandwich. It’s this juicy slab of steak that they shovel into a triangle of pogacha bread (I think). They then douse it in this amazing garlic sauce and top it with onions. It’s not a great date snack (I literally had garlic sauce in my hair) but wow oh wow is it delicious. You’ll find him atop a Glühwein hut in Kennedyplatz. You’re welcome. All hail the great Moose of Essen Christmas Market! 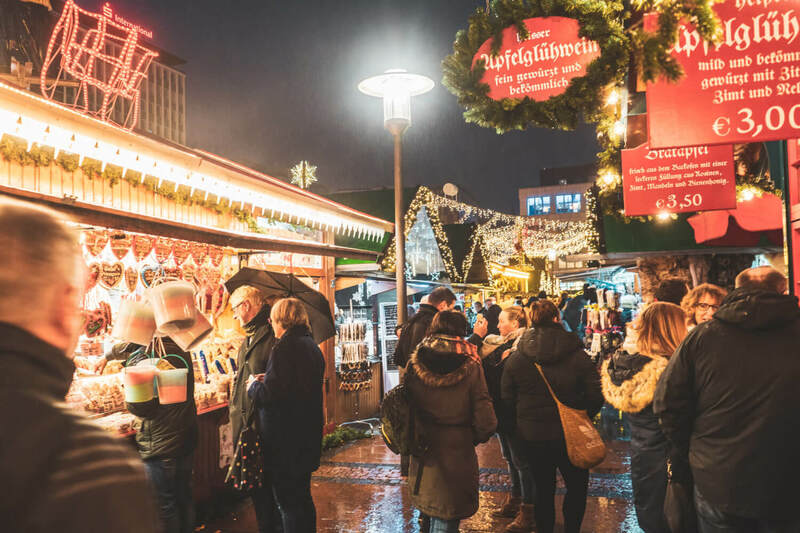 Any questions about Essen Christmas Market? 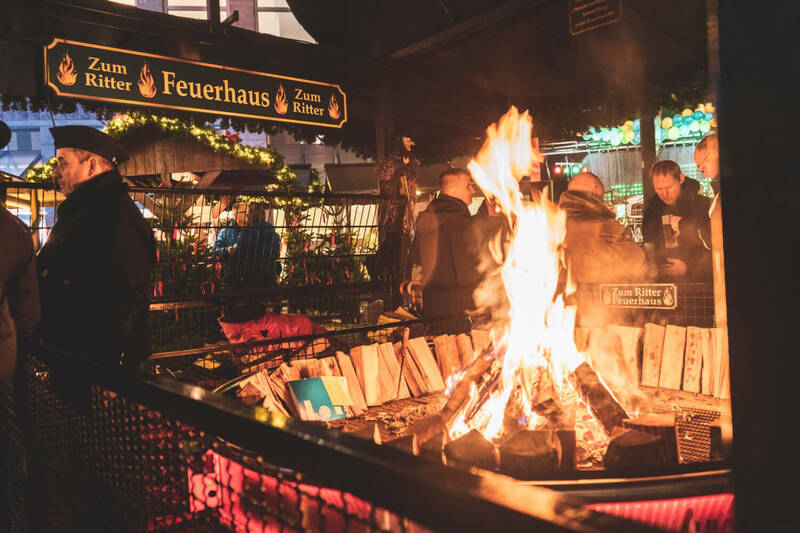 Previous ArticleFrankfurt Christmas Market Guide: Where to Go, What to Eat & More! 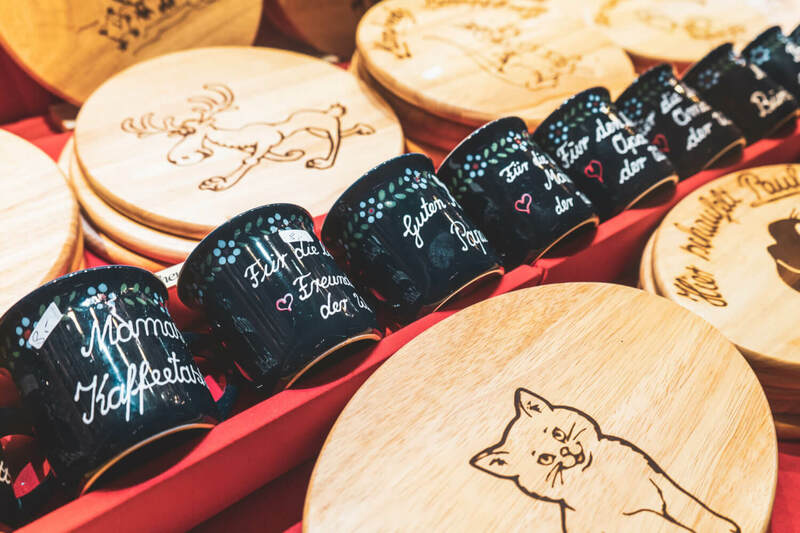 Next ArticleNuremberg Christmas Market Guide: Where to Go, What to Eat & More!